​I’ve watched birds for as long as I remember. I think that my grandmother gave me a book of the birds of Switzerland when I was young — I certainly remember desperately wanting to see a red kite (this was the 1980s when they were very scarce). However, moving across continents twice, dealing with the growing-up blues, and a lack of guidance (the only exposure I had to biology was learning the different parts of a cell), meant that I lost track of this interest until my early 20s. By this time I was already well into a dual degree programme in Microelectronic Engineering and Computer Science. Turns out, I hated it. This was prolonged by several years working in industry, which even though I got to watch first-hand tonnes of steel being made (actually it is quite an interesting process), I struggled to find value and personal reward in my work. My breakthrough came when I got involved with a local group of fanatic birders who would go out catching seabirds at sea. Here I rediscovered my early passion for birds while satisfying my cravings to be out on the ocean (a lifetime of yacht racing does that). Through befriending academics from the Australian National University, I discovered a world previously unknown to me. 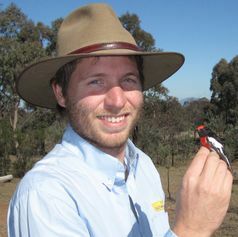 Within a few years I became an accomplished bander/ringer, and established a small research project. By chance, I one day literally stumbled across a PhD position advertised to study social networks in songbirds in Wytham Woods, Oxford. I took a shot – and haven’t looked back since.